Do you do too much for your kid out of fear they will never make it in the world without your oversight? Are you frustrated or worried about your 'tween, teen, or young adult who seems lazy or unmotivated? Do you see your child unable to reach their potential because they are disorganized, scattered, and can't manage their time? In Your Kid's Gonna Be Okay: Building the Executive Function Skills Your Child Needs in the Age of Attention, Michael Delman tackles the big worries that keep parents awake at night. In a conversational tone informed by deeply-rooted expertise, Delman illustrates how to connect meaningfully with your child and encourage habits that lead to success in school -- and in life. 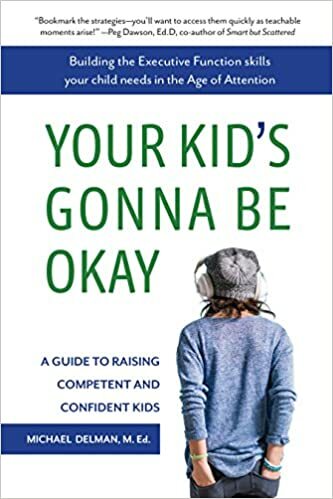 Your Kid's Gonna Be Okay helps parents understand the critical skills needed for effective self-management and provides specific strategies and tools to help kids become motivated, accountable, and independent. Through engaging stories that illustrate how we all build Executive Function skills, Delman demonstrates how kids can change their habits as they pave their own path toward competence today and confidence in their future. Parents of kids with ADHD or other learning differences - or parents worried about how their child can manage distractions will benefit from Delman's experience as an educator, an Executive Function coach, and as a parent. Cassandra's Review- Get more in tune with your child and help them by thinking more in depth about ways to better approach situations. The author breaks down good information and adds his own thoughts to help the parent in an easy to understand way without overwhelming both you and your child.